Then Jesus told his disciples, “If anyone would come after me, let him deny himself and take up his σταυρὸν and follow me. looking to Jesus, the founder and perfecter of our faith, who for the joy that was set before him endured the σταυρὸν, despising the shame, and is seated at the right hand of the throne of God. I'm currently studying the New World Translation written by the Jehovah's Witnesses and they claim that the Greek word for cross can be translated as 'Torture stake'. Is this correct? If this is the case, is there anything beside the scripture that implies the object was indeed a cross? While I think that the claim that σταυρός referred to a simple upright stake is supported in the ancient Greek literature, there is not support for a claim that this same meaning applied exclusively during the time of Christ. The use of the word to refer to a simple stake can be found in the Odyssey, the Iliad, Thucydides' The Peloponnesian War, and Xenophon's Anabasis. All of these works date from 354 BC or earlier. Both Thucydides and Herodotus (5th c. BC) also the word in the sense of "piles" to serve as a foundation. Descriptions of σταυρός as a "cross", as we understand it, however, emerged sometime in the century prior to Christ or earlier, in the writings of Diodorus Siculus, a Greek historian living in Sicily. 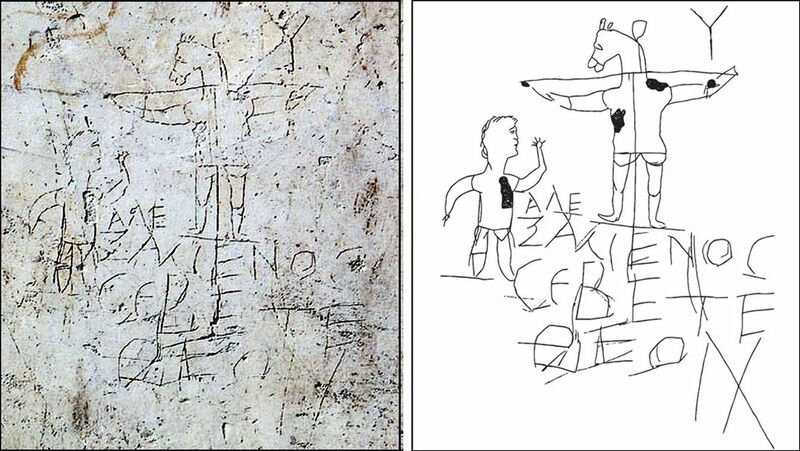 Beyond the overwhelming corpus of the early Church Fathers, we also have the Alexamenos graffito, which is apparently a caricature of Christians worshipping a donkey on a cross. I am speculating here, but it may be that when the Hellenic cultures first encountered the Roman torture instrument we call the "cross", the closest word in Greek to describe it was σταυρός. The beginning of the use of the word σταυρός in this context seems to have coincided with the Roman conquest of the Hellenic world. If this were not the case, then we would expect to see some other word in the Greek vocabulary emerge to describe it. In most regards, these can actually be thought of as synonymous for a couple of reasons. First, many believe that crucifixion actually originated with the Assyrian empire. 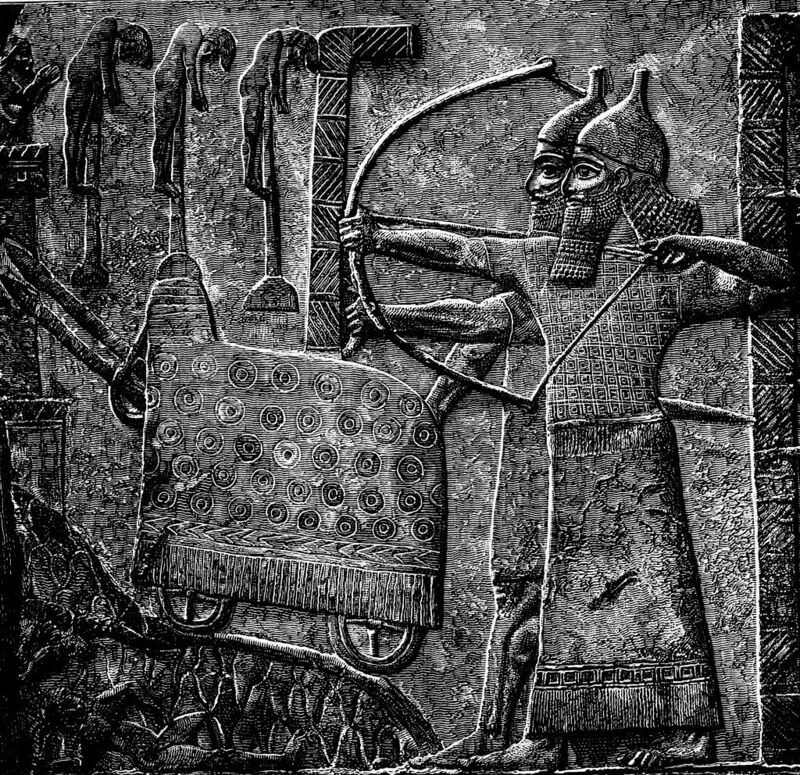 It was a favorite tactic of the Assyrians to impale victims en mass alive on poles outside of a fortified city they wished to conquer as a means of psychological warfare. The victims' screams were used to convince the target city that it would be better to surrender and avoid the same fate than to face the Assyrian empire. Later, crucifixion began being used by the Persians in a manner more similar to the crucifixion of Christ. 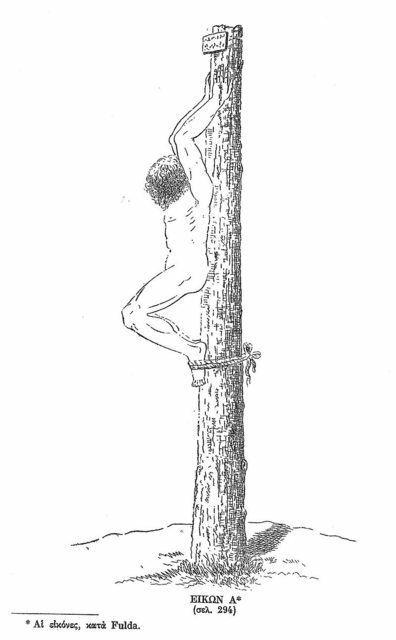 This persisted among several major cultures until it was picked up and used by Alexander the Great against the Phoenicians The major difference in early usage of this torture method by the Persians and others was that this was often done on a stake or tree without the use of a cross-member (or "patibulum"). This type of cross is known as a crux simplex and is the primary reason σταυρός can be translated as an upright stake. Another reason this may be referred to as an upright stake has to do with exactly how crucifixions happened in the Roman Empire. There is actually some thought within scholarship that Jesus may have been hung on a Tau Cross. In the Roman Empire, when a specific place was used for crucifixion, they would typically bury a pole in the ground which was then used repeatedly. Installing a new cross on the hill of Golgotha each time another crucifixion was taking place was simply too troublesome. Instead, after each body was taken down, the patibulum only was removed and the main part of the cross - a stake - would be left behind. When a crucifixion occurred, the prisoner would be forced to carry only their patibulum (the cross-member), not the entire cross. This would then be either nailed to the stake left behind after each crucifixion or set on top of and nailed down into the top of the stake depending on if it was a Tau cross or a cross like that which is depicted in most Christian iconography. For obvious reasons, it was easier to nail a patibulum (with victim already attached) to the stake using a tau cross which accounts for its popularity with the Romans (this was actually the most widely used type of cross by the Roman Empire) It is therefore not wholly inappropriate to think of σταυρὸν as referring to the buried stake left behind after a crucifixion was completed. As you can see from this brief history, when σταυρὸν is used in the context of torture, there really is no difference between "stake" or "cross". These refer to the same method of torture. While this could be meaningful if σταυρὸν was being used in the context of gardening for example, it is doubtful that that there is any meaningful difference in the context in which you are discussing it. 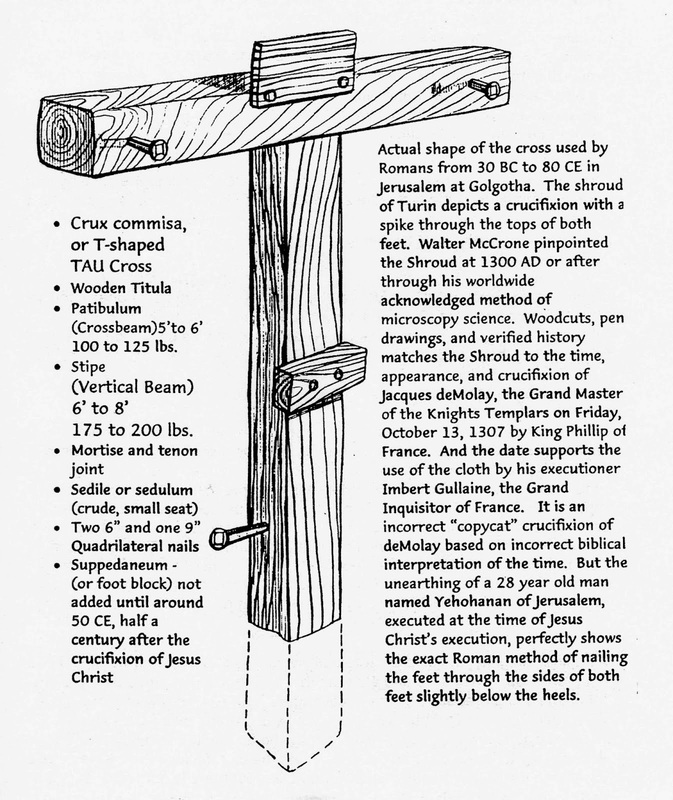 For the sake of clarity to modern readers, it seems then that the most clear meaning would be "cross" as most laypersons probably do not know the history and methods of crucifixion and would be unable to understand that a "buried stake" and a cross are essentially the same thing in the context of torture. This rendering would be unnecessarily confusing to modern readers and over-literal. The word cross used here in Greek from Scriveners Textus Receptus is σταυρός, οῦ, ὁ, stauron, stavron or stauros and means crucifix or a cross. This word he uses over 20 times to describe crucifixions carried out by the Romans against Jesus and hundreds of other Jews. Christus, from whom the name had its origin, suffered the extreme penalty during the reign of Tiberius at the hands of one of our procurators, Pontius Pilatus, and a most mischievous superstition, thus checked for the moment, again broke out not only in Judaea, the first source of the evil, but even in Rome, where all things hideous and shameful from every part of the world find their centre and become popular. Accordingly, an arrest was first made of all who pleaded guilty; then, upon their information, an immense multitude was convicted, not so much of the crime of firing the city, as of hatred against mankind. Mockery of every sort was added to their deaths. Covered with the skins of beasts, they were torn by dogs and perished, or were nailed to crosses, or were doomed to the flames and burnt, to serve as a nightly illumination, when daylight had expired. Biblical accounts of a cross are strongly supported by historical writings. IN THE HEBREW SCRIPTURES (N.W.T.) WHERE "STAKE" APPERS ALONG WITH THE WORD USED IN THE LXX, XY'LON. Luke, Peter, and Paul used XY'LON as a synonym for stau·rosʹ gives added proof that Jesus was killed on an upright pole or stake without a crossbeam, for that is what xyʹlon in this special sense means. (See Acts 5:30; 10:39; 13:29; Gal. 3:13; 1 Pet. 2:24) Xyʹlon also occurs in the Greek Septuagint (see below) where it refers to a single beam or timber or pole on which a lawbreaker was to be executed. Look up the Greek words for "Stake" etc. in the Septuagint (LXX) and you will see "stau·ros"
Joshua 8:29 "And he hanged the king of A'i upon a stake [LXX xyʹlon "gallows"-Benton] until the evening time; and as the sun was about to set Joshua gave the command, and then they took his dead body down from the stake [LXX xyʹlon "tree"-Benton] and pitched it at the entrance of the gate of the city and raised up a great pile of stones over him, down to this day." Joshua 10:26-27 "And after that Joshua proceeded to strike them and put them to death and hang them upon five stakes [LXX xyʹlon "tree"-Benton], and they continued hanging upon the stakes [LXX xyʹlon "tree"-Benton] until the evening. 27 And it came about that at the time of the setting of the sun Joshua commanded, and they went taking them down off the stakes [LXX xyʹlon "tree"-Benton] and throwing them into the cave where they had hid themselves. Then they placed big stones at the mouth of the cave—until this very day." Esther 2:23 "So the matter was sought out and eventually found out, and both of them got to be hanged on a stake [LXX xyʹlon]; after which it was written in the book of the affairs of the days before the king." Esther 5:14 "At that Ze'resh his wife and all his friends said to him: “Let them make a stake [LXX xyʹlon"gallows"-Benton] fifty cubits high. Then in the morning say to the king that they should hang Mor'de•cai on it. Then go in with the king to the banquet joyful.” So the thing seemed good before Ha'man, and he proceeded to have the stake [LXX xy'lon, "gallows"-Benton made." Esther 6:4 "Later the king said: “Who is in the courtyard?” Now Ha'man himself had come into the outer courtyard of the king’s house to say to the king to hang Mor'de•cai on the stake [LXX xyʹlon "gallows"-Benton] that he had prepared for him." STAKE - SOME EXAMPLES FROM THE CHRISTIAN GREEK SCRIPTURES (N.T.). Matthew 26:47 And while he was yet speaking, look! Judas, one of the twelve, came and with him a great crowd with swords and clubs [stau·ros] from the chief priests and older men of the people. Matthew 26:55 In that hour Jesus said to the crowds: “Have YOU come out with swords and clubs [stau·ros] as against a robber to arrest me? Mark 14:43 And immediately, while he was yet speaking, Judas, one of the twelve, arrived and with him a crowd with swords and clubs [stau·ros] from the chief priests and the scribes and the older men. Mark 14:48 But in response Jesus said to them: “Did YOU come out with swords and clubs [stau·ros as against a robber to arrest me? Luke 22:52 Jesus then said to the chief priests and captains of the temple and older men that had come there for him: “Did YOU come out with swords and clubs [stau·ros]as against a robber? Footnotes Matthew 10:38 “Torture stake.” Gr., staur¬n (stau•ron'); Lat., cru'cem (from crux). See App 5C. Matthew 23:34 Or, “fasten on a stake (pole).” See App 5C. 2 Corinthians 13:4 Or, “fastened on a stake (pole).” See App 5C. The book The Non-Christian Cross, by John Denham Parsons, states: “There is not a single sentence in any of the numerous writings forming the New Testament, which, in the original Greek, bears even indirect evidence to the effect that the stauros used in the case of Jesus was other than an ordinary stauros; much less to the effect that it consisted, not of one piece of timber, but of two pieces nailed together in the form of a cross. . . . it is not a little misleading upon the part of our teachers to translate the word stauros as ‘cross’ when rendering the Greek documents of the Church into our native tongue, and to support that action by putting ‘cross’ in our lexicons as the meaning of stauros without carefully explaining that that was at any rate not the primary meaning of the word in the days of the Apostles, did not become its primary signification till long afterwards, and became so then, if at all, only because, despite the absence of corroborative evidence, it was for some reason or other assumed that the particular stauros upon which Jesus was executed had that particular shape.”—London, 1896, pp. 23, 24. "Cross, Crucify: denotes, primarily, "an upright pale or stake." On such malefactors were nailed for execution. Both the noun and the verb stauroo, "to fasten to a stake or pale," are originally to be distinguished from the ecclesiastical form of a two beamed "cross." The shape of the latter had its origin in ancient Chaldea, and was used as the symbol of the god Tammuz (being in the shape of the mystic Tau, the initial of his name) in that country and in adjacent lands, including Egypt. By the middle of the 3rd cent. A.D. the churches had either departed from, or had travestied, certain doctrines of the Christian faith. In order to increase the prestige of the apostate ecclesiastical system pagans were received into the churches apart from regeneration by faith, and were permitted largely to retain their pagan signs and symbols. Hence the Tau or T, in its most frequent form, with the cross-piece lowered, was adopted to stand for the "cross" of Christ. As for the Chi, or X, which Constantine declared he had seen in a vision leading him to champion the Christian faith, that letter was the initial of the word "Christ" and had nothing to do with "the Cross" (for xulon, "a timber beam, a tree," as used for the stauros, see under TREE). (b) "the crucifixion suffered," e.g., 1Cr 1:17, 18, where "the word of the cross," RV, stands for the Gospel; Gal 5:11, where crucifixion is metaphorically used of the renunciation of the world, that characterizes the true Christian life; Gal 6:12, 14; Eph 2:16; Phl 3:18. I can get lots more on this for you if you like, but hope this helps for now. This is the expression used in connection with the execution of Jesus at Calvary. There is no evidence that the Greek word stau-ros' meant here a "cross" such as the pagans used as a religious symbol for many centuries before Christ to denote the sun-god. 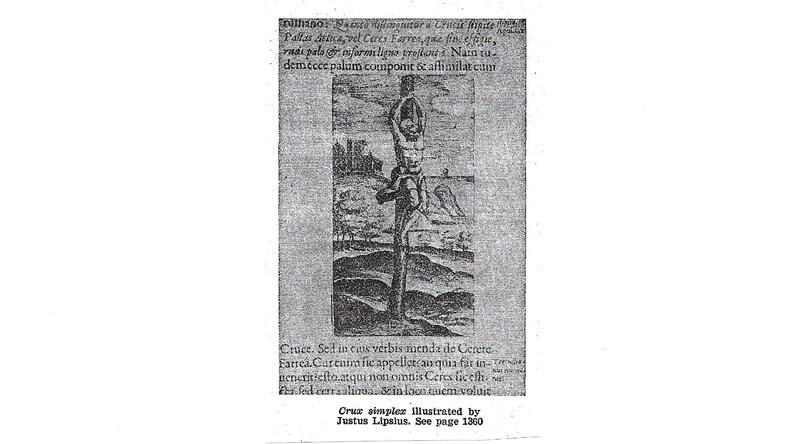 A copy of the picture, "Crux simplex" by Justus Lipsius, which depicts this manner of execution is included:2 Lipsius' rendering made in 1594 CE, is a poor example. It fails to show the message above Jesus head (Matthew 27:37; Mark 15:26; Luke 23:38; John 19:19). Nor is Jesus "impaled" as the Assyrians practiced (see picture in James Shewey's answer). Seneca (4 BCE-65 CE) is believed to have written the Consolation to Marcia around 40 CE, shortly after Jesus' crucifixion.5 At the time he was in Rome and likely he is describing practices there. However, if crucifixions were carried out using different crosses in Rome, there is no reason to doubt this practice at that time elsewhere in the Empire. Using different types of crosses is evidence the NWT may be correct. At the same time it contradicts their assertion the text must be rigidly understood to mean there was only one way the word can be understood. The NWT translation philosophy is consistent with a prohibition of pagan practices such as using the "cross" in worship or as jewelry (which may be an accurate understanding of early Christianity). Translating the word as "stake" eliminates these practices. It conveys a visual understanding objectively with no implication of pagan idolatry. It is an additional way the copyist’s vorlage can be interpreted. Using the staurogram means this copyist intends a reader to understand Luke's σταυρὸν is a cross. The Jews wanted all three men to specifically die by crucifixion. If death was the only objective, the request would have been to kill by the spear to bring about immediate death. Legs were integral to crucifixion: unbroken legs delayed and broken legs hastened death. The knowledge broken legs brought death quickly is consistent with death by asphyxiation, either directly or in conjunction with other factors like hypovolemic shock. The legs were broken in order to prevent the victim from using them to "push or raise up" to breathe. There is an exercise to demonstrate the issue. Pull ups done with the arms spread wide are more difficult than with hands close together. If the grip is too wide, the shoulders will be damaged. Breaking the legs of someone being crucified means the body is then supported by the shoulders. If the hands are over directly overhead as they must be on a "torture stake" the shoulders are affected much less than if the arms are outstretched. In fact, breaking the legs of someone hanging with outstretched arms, will undoubtedly cause immediate damage to the shoulders rendering the victim completely unable to raise up to breathe. Jesus was not stoned according to Jewish law. He died by means of Roman execution. Thus the Gospel narratives should be approached as descriptions of a Roman practice, not something faithful to Greek mythology, as the NWT suggests. There is evidence different types of crosses were used, but, in addition to tradition, abbreviations in manuscripts, graffiti mocking Christians, and the breaking of legs all support crucifixion with arms stretched wide on a cross. 1. New World Translation of the Holy Scriptures, Watchtower Bible and Tract Society of New York, Inc., Third Revision With Footnotes 1971, 1981, p. 1360. 7. New World Translation, pp. 1360-1361. Not the answer you're looking for? Browse other questions tagged matthew word-study hebrews cross or ask your own question. The Greek word “Stauros” does it mean Cross or Stake? What does the Greek word υποστασεως mean in Hebrews 1:3? Hebrews 12:2 - Any Other Translations For “Enduring” the Cross? In Matthew 12:34-37 what are “idle/empty words”? What is the meaning of Hebrews 13:3 “you are also in the body”? What is the meaning of the Greek word “ἐχθροὺς” in Matthew 5:44?